Journalism students at UL have scooped the prestigious Newspaper of the Year title at the National Student Media Awards. 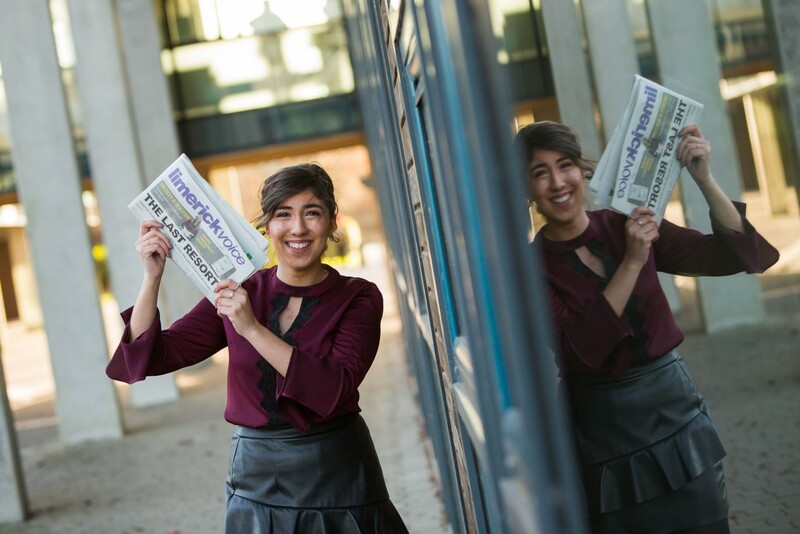 Limerick Voice a 40-page local newspaper, produced by masters and fourth year Journalism and New Media students won the top media award in the category sponsored by The Irish Times. The UL newspaper is part of a module taught to journalism students and is published every December with The Limerick Leader newspaper. Limerick Voice also has a strong digital presence and its news website www.limerickvoice.com, was nominated for Website of the Year at the 2018 Smedias. Marisa Kennedy (22) from Lorrha in Co. Tipperary was Editor of Limerick Voice 2017, which was also nominated in a number of other categories. “To receive this recognition from some of the most well-known names in the media industry is a wonderful testament to the hard work and dedication of the entire Limerick Voice team. This win is yet another confirmation that UL is establishing itself as one of the country's leading hubs for journalism and I hope that this win will spark further success for the university in future years,” she said. Third year Journalism and New Media student Mark Boylan (20) was named Sports Writer of the Year at National Student Media Awards or the Smedias as they are more popularly known. The Banagher, County Offaly, man, who recently completed a work placement with The Racing Post, was honoured for three stories he had published in the newspaper including a two page feature on Ruby Walsh and the now retired Limerick racing legend Beef or Salmon. “As someone with an enormous passion for horse racing, the seven months I spent with the Racing Post for my work placement from UL were unbelievably enjoyable and I'm very grateful for the effort that all the staff invested in improving me as a reporter,” he said. “The Journalism @ UL team have been a fantastic support to me from minute one of my time at university. I'm fully aware that I'm extremely fortunate to be in this position in which I'm relishing getting up in the morning to watch horses run around in a circle and report on the action - it's an absolute privilege. I'm keen to continue improving as much as possible and, please God, embark on a full-time career in sports journalism upon graduating next year,” he continued. The National Student Media Awards or the Smedias as they are more popularly known, is the largest competition of its kind in Ireland dedicated to recognising and celebrating the next generation of media talent. Open to students from every college across Ireland, the awards are judged by key media industry leaders including Mark Hennessey, News Editor of The Irish Times, and Fionnan Sheahan, Editor of The Irish Independent. UL journalism students were nominated in a number of other high-profile categories, including fourth year student Simon Bourke from Kilkenny who was nominated for Journalist of the Year and received a special judges’ mention. Among Simon’s stories was a report of one Limerick family’s extraordinary journey to ease the agony of terminal illness, which was first published in Limerick Voice. Kathryn Hayes, Course Director BA in Journalism and New Media, who oversees the Limerick Voice module, said she was delighted to see the work of journalism students acknowledged by industry leaders. “This is a huge statement about UL’s journalism programme and also about the students themselves who this proves are becoming quality journalists. This recognition from industry, with top national newspapers on the judging panel, shows that our students’ talent is being recognized early in their careers. These students will go on to on to make very significant impacts on society through this great profession,” she commented. UL Head of Journalism Mary Dundon congratulated Limerick Voice editor Marisa Kennedy and all the students involved in winning this prestigious national award. “They were very lucky to have the guidance and direction of their lecturer Kathryn Hayes who was instrumental in our journalism students winning this award for the first time,” she said. Ms Dundon also congratulated Mark Boylan on winning the Sports Journalist of the Year award.